Strong, light and flexible, our air cushion packaging products answer to a wide range of protective packaging and void fill needs. 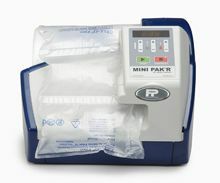 Our MiniPak'r Machine rolls are made from easy to store rolls of film, whilst our Fill-Air pillows are supplied flat. Air cushioning is the perfect alternative to bulky and messy materials and is quickly inflated on demand. For the MiniPak'R machine, we have 5 different styles and sizes of film to address specific packaging needs: Available accessories are a foot pedal, a mobile air bag storage bin, a wheeled bin for mounting the machine, and a replacement belt kit. Air bag packaging is incredibly light for posting, being made up of 99% air! As well as being up to 30% lighter than other packaging materials, our inflatable packing is specially designed to secure your goods during transit, keeping them in place while providing a clean and dry protection. We have various air cushioning pillow products that you can use for most of your void fill and packaging needs. The small quilt air cushioning is perfect for wrapping small to medium products in a bubble wrap film, while the large quilt air cushions are ideal for bigger objects. Our flexible Novus Supertube folds in two ways and is a convenient method to protect and hold breakable objects, while for large void fill you can use the Novus double large air cushions. Our popular Film 130 air pillow packaging is excellent for less fragile items. MiniPak'R accessories are available to make the system even more ergonomic, flexible and time saving. Air cushioning is easier to handle by using a foot pedal to operate the machine and/or a wheeled bin to carry or store the air bags. You can also move the whole system to various packing stations without taking up room on the tables, by mounting the MiniPak'R on a specially designed mobile bin/storage cart. We also supply replacement belt kits. Saving you on postage because they are lightweight, Minipak'R packaging cushion products are created by loading the various perforated films on our bubble wrap machine. 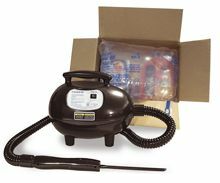 With the Fill-Air inflator, you simply inflate your chosen size of pillow as required. Once produced, you simply pop the pillow packing into cartons or boxes to give the contents high impact resistance. You can choose from any of our range of double wall corrugated boxes, seal with one of our adhesive tapes and with your goods protected by the air cushion packaging you are assured of their safety and security!